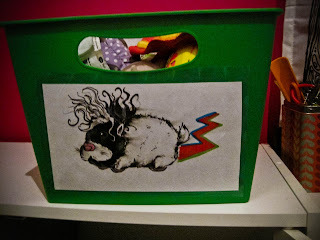 At the onset of this blog, one of the first DIY projects I shared was Hazel's Toy Chest, which inevitably, was a better idea in theory than in practicality. The problem with the chest is that she is unable to use it, as the lid is quite heavy and a little out of reach. 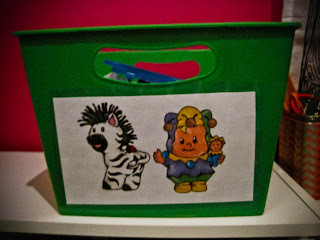 It since then has become Hazel's Toy Chest for soft toys and stuffed animals. Which in turn, has left all the other toys to gather in a general pile in the corner. 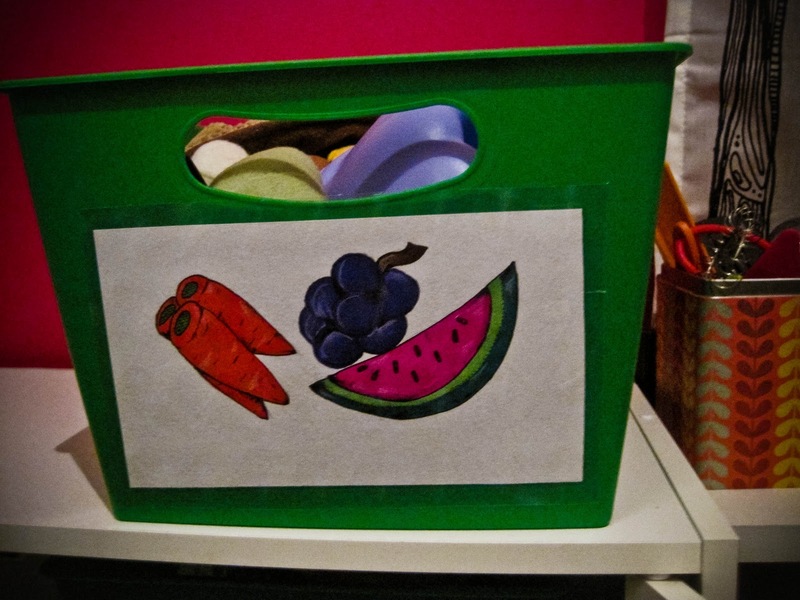 Simply unacceptable for the organized life, right? In our closet upheaval, one of the items that was removed was a simple white cabinet with 2 doors. It was originally stacked on top of our EXPEDIT unit to house art supplies. With the closet reno, we were able to better organize the EXPEDIT, and actually had no need, nor room for, this white cabinet. So, off to the donation pile it went. But, it didn't stay there very long. 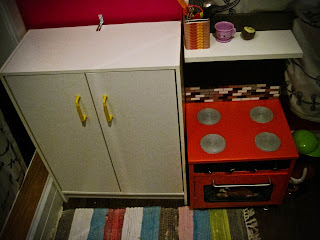 Immediately, once her play kitchen was completed, Hazel took right to it, and Jackie suggested to use the empty cabinet as a fridge of sorts. 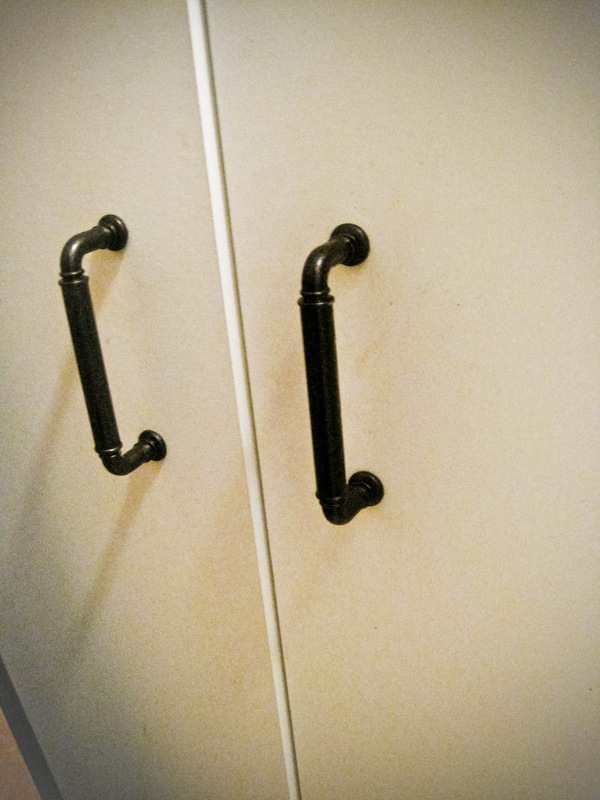 We bounced the idea around of painting it to look more like a fridge, but didn't really go anywhere with it. Over the past few weeks, it has gone from housing play food to literally, all of Hazel's toys. And it became a chaotic mess! The solution? IKEA? Nope, not this time. Instead, we went on a walk to the dollar store. I figured that with the 3 shelves, we could use the bottom for large toys, and the top 2 for some bins. We happened upon these lovely kelly green bins (I have a soft spot in my heart for this color!) at $1.50 each! Beat that, IKEA! (but, please don't hate me for my dollar store enthusiasm). I've always been a little skeptical of dollar store purchases. They generally stink, and simply being in the store itself is always such a depressing experience. But we have a brand new store next to our Benjamin Moore, and it's always so clean, and only stinks a little bit! 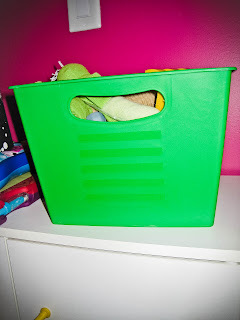 The 4 bins we purchased fit perfectly- almost as though they were made for the space! But, looked a little bland. 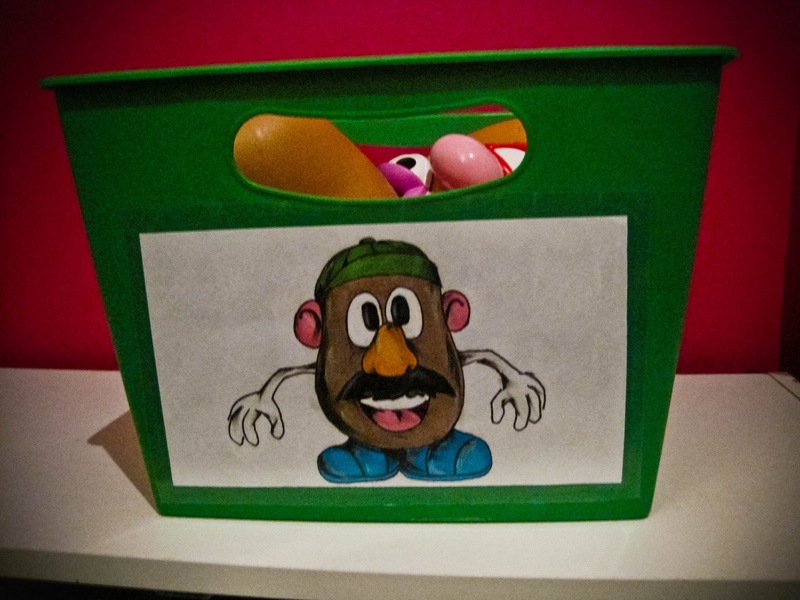 I decided to label the bins with drawings of the toys that were supposed to go in each bin. of her Zhu Zhu pets... I'm still not sure why. I really don't like those things. turn off a Zhu Zhu pet, please let me know!!! I attached the drawings to the bins and used some clear contact paper to protect them from any scratches or dings that could happen. At this point, I stopped to realize one of two things: Firstly, the shelving unit is, by no means, safe for a child's play as is. It needed to be wall mounted, as the unit was quite narrow and a bit top-heavy. I found an L-bracket, and mounted the shelving unit to the pink wall (sorry pink wall, this might hurt a little!). I love that the unit is short enough for her to reach toys stacked on top, and there is a bit of space above the chest that could be perfect for a little shelf (if her toy collection accumulates too much). so, use your imagination a bit! Pretty boring, right? 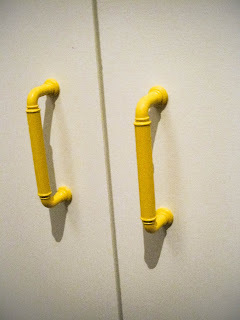 Well, I found this pair for .50 at work (metal handles from a Martha Stewart kitchen and on the cheap too- ooh lala), and painted them a high gloss bright yellow (<3). I'm digging the yellow and white combination against the pink. The trio of colors is my favorite combination right now- and the rest of our place better watch out before I paint everything in those colors! 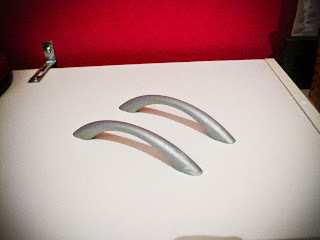 Oh, and while I was at it, Our pantry cupboard had the same old handles as the vertical toy chest, so I painted them Oil Rubbed Bronze (yes, I'm still obsessed) and swapped them out too. I know, it's a little change, but it's the little changes that matter the most. 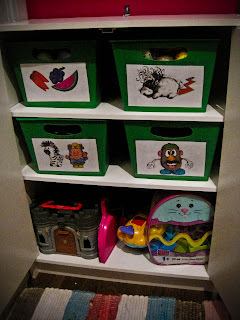 Once again, a piece of furniture that was headed for the dump has found a new purpose in our home, and is providing us with daily function... that is, it will be, once we get the message of only one toy bin out at a time across. And there you have it: a vertical toy chest! (...or, a repurposed shelving unit that now holds toys).